33.5 mm (W x H) and has been studied for panel mounting. Alarm buzzer: optional (not available for EVK401). Digital input: 1 (multifunction): EVK421, 402 and 403 model only. Alarm (8A res. 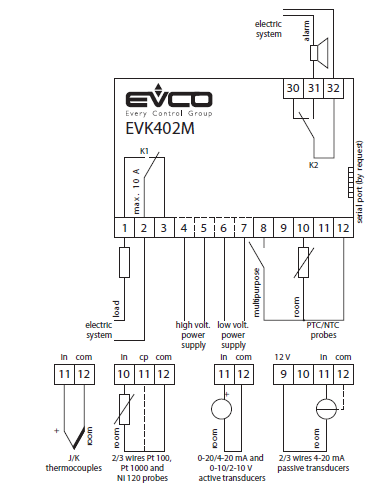 @ 250 VAC relay) EVK402 model only. 2 Outputs:Load 1 (8A res. @ 250 VAC relay); 16A res. in the multiprobe vers. Load 2 (8A res. @ 250 VAC relay).